A regular part of the Charlotte Mason student’s repertoire was the memorization of three hymns per 12 week term. Singing hymns in corporate worship is not only a wonderful way to begin your school day, but it’s also a useful way to teach solid theology to your children. Even if you prefer contemporary worship, the lessons to be learned by studying the hymns of our faith are invaluable. Don’t miss this opportunity! Hymns can also be used for recitation, copywork and dictation. Additionally, your auditory learners will take quickly to memorizing hymns as it is obviously most easily accomplished by singing them aloud! Having your own hymnal is helpful for hymn study, but you can also find a multitude of hymns online at websites such as NetHymnal. One thing that’s handy about NetHymnal is that it often provides interesting background about the hymn as well as its writers. 3. Point out the theology inherent in the hymn, particularly if you have older children, and identify new words as necessary. You would be surprised how easily memorization comes if you faithfully sing the hymn every day for a month! 1. Blessed Assurance, Jesus is Mine, written by Fanny Crosby (words) 1820-1915 and Phoebe Palmer Knapp (music) 1839-1908. Here is a copy of the words with the music. Fanny Crosby, an American woman who lived from 1820 to 1915, wrote the words to this hymn. She wrote literally thousands of hymns, yet she was blinded as an infant after being treated by an incompetent doctor. How do you think you might feel about God if that had happened to you? Explain how she felt in your own words. How do you think she could feel that way after what had happened to her? Phoebe Palmer Knapp was a long time friend who went to the same church as Fanny. It is said that Mrs. Knapp played Fanny the melody on the piano that became Blessed Assurance and Fanny came up with the song title on the spot! 4. Sing, with accompaniment if possible, Blessed Assurance, Jesus is Mine, every day for a month. I know what you are thinking…. You would just love to do hymn study but you are having enough trouble trying to get in math and writing. You can keep this as simple as you like or start as slowly as you want. But you and your children’s lives and family worship will be enriched by hymn study, I promise! If you start this when your children are on the younger side, think of how many hymns they could learn by the time they are in high school! If you already do hymn study in your home, how do YOU do it? Perhaps we do not attach enough importance to the habit of praise in our children’s devotion. Praise and thanksgiving come freely from the young heart; gladness is natural and holy, and music is a delight. The singing of hymns at home and of the hymns and canticles in church should be a special delight; and the habit of soft and reverent singing, of offering our very best in praise, should be carefully formed.But the duty of praise is not for occasional or rare seasons; it waits at our doors every day. –Charlotte MasonA regular part of the Charlotte Mason student’s repertoire was the memorization of three hymns a term. Singing hymns in corporate worship is not only a wonderful way to begin the day, but it is also a very useful way to teach solid theology to your children.Even if you prefer contemporary worship, the lessons to be learned by studying the hymns of our faith are invaluable and should not be missed.Hymns can also be used for recitation, copy work and dictation. Additionally, your auditory learners will take quickly to memorizing hymns as it is obviously accomplished by singing them aloud.Having your own hymnal is helpful for hymn study, but you also can find a multitude of hymns online at websites such as NetHymnal.One thing that’s handy about NetHymnal is that it often provides additional information about the hymn writers’ lives and background that aid the teacher in presenting a hymn. Hymn Study Made EasyIn our family, we chose to learn one hymn about every month, depending upon the length and “language” of the hymn. (Some of the words and concepts are lengthier and/or more difficult than others.) Here is our routine:1.First, choose a hymn, type up the words and copy them for each child. It is often helpful to copy each stanza together in paragraph form to enable children to really focus on the words.If you have young children, you might want to copy the hymns using the Startwrite Program, especially if you plan to use the hymn for copy work. 3.Point out the theology inherent in the verse and identify new words. 5.If you or one of your children play piano or guitar, make sure you include an instrument in your singing. 6.You would be surprised how easily memorization comes if you faithfully sing the hymn every day for a month. 1.Blessed Assurance, Jesus is Mine, written by Fanny Crosby (words) 1820-1915 and Phoebe Palmer Knapp (music) 1839-1908.Here is a copy of the words with the music. nPhoebe Palmer Knapp was a long time friend who went to the same church as Fanny.It is said that Mrs. Knapp played Fanny the melody that became “Blessed Assurance” and Fanny came up with the song title on the spot! nAssign one stanza along each week as copy work. nAssign one stanza each week as memorization to be recited. nHave your student write out this hymn in his own words. nAfter studying this hymn, have your student create her own hymn. nAssign your student to find a passage of Scripture and compose a melody to accompany it. Thank you for sharing how hymn studies work in your home, we are starting this year and I was clueless of how to begin other than singing! I love how you laid out your post, thanks so much, it was very helpful! 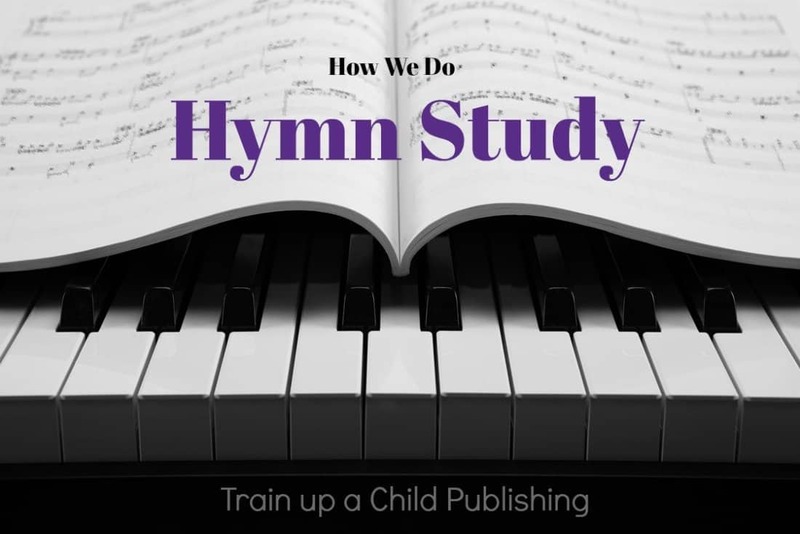 Thank you for sharing these detailed plans for a hymn study! We learn two hymns a semester for our school and one hymn for our Family Sunday School class. It truly is a wonderful and natural way to learn so many of God’s truths, not to mention the comfort and beauty they add to our lives. Hi Lindsey! We have always studied history chronologically and worked composer/music study in with history – doing it that way helped me be more regular about it. I’m glad you enjoyed the post! 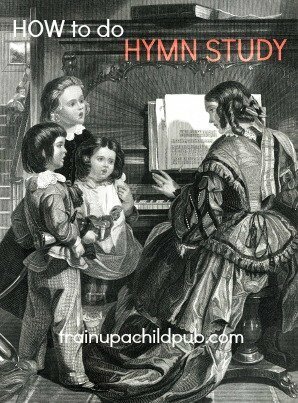 I’m sure you will enjoy adding hymn study to your school this quarter! Thank you, Katie, for taking the time to comment! This is such a helpful unit study! We’re incorporating it into our school this quarter. Thanks so much for sharing! I sure enjoyed the posting describing Micah’s last trip down the Amazon! Thank you for giving us a glimpse of what your lives are like!